The name Mason Neck reflects the connection of this land with the Mason family, which during the seventeenth and eighteenth centuries had amassed some 5,000 acres of land in this southeastern corner of Fairfax County. Historic regional maps and nautical charts of the last two centuries identify this land on the Potomac as Masons Neck. Three principal places, and their interconnections, anchor the perimeters of the area, and also illustrate its history: Gunston Hall, Pohick Church, and the town of Colchester. Other sites and structures within the Mason Neck area represent other layers of history. The history of these places illustrates the way colonial Virginians, moving north from the settled lands along the James and York River, settled along the Potomac and Occoquan Rivers, and imposed their religeous/civil government, their travel and trade needs, and their domestic arrangements upon the land already shaped by generations of Dogue Indians. The first George Mason left England and settled along the Potomac River in the Northern Neck by 1652. He served as an elected Burgess for Stafford County. By the time of the second George Mason, the pattern of economic and social development of Tidewater Virginia was taking shape. Tobacco became the staple crop, and with its dominance, planters began to amass vast land holdings, displacing the subsistence farmers. As the importation of slaves increased, the large plantations became more self-sufficient. The Potomac River served to unite the colonies of Maryland and Virginia, which shared common economic concerns and defense against the Indians of the upper Potomac. The second George Mason married a member of the distinguished and wealthy Fowke family of Maryland. Mary Fowke Mason was the mother of seven children, including George Mason III. In his generation, this Mason continued to represent Stafford County in the House of Burgesses in Williamsburg, where he met and married Ann Thomson. He also continued to increase his land holdings, acquiring large grants south of the Occoquan River. [This estate was later named "Woodbridge" by Thomas Mason, son of George Mason IV, for the wood bridge that replaced the ferry crossing at the town of Colchester on the Occoquan.) In possession of lands on both sides of the Occoquan River, George Mason III enjoyed a monopoly on the ferry, as well as fishing rights on Belmont Bay, which for a long time remained an important source of family income. George Mason III also established a ferry landing in the area known today as Hallowing Point. In the generation of George Mason IV, family interests were centered in Virginia. Mason was already living in a house on Doegs' Neck when, in 1750, he married Ann Eilbeck, from a large and wealthy Maryland Family. He soon started construction of a new home which he named Gunston Hall in memory of an old estate in Britain. Gunston Hall is a brick, one and one half stories tall Georgian House. William Buckland was brought from England as an indentured servant to oversee the elaborate carving and interior decoration of the simple Georgian brick structure. Another indentured servant, William Bernard Sears, did the actual carvings. Among his many accomplishments, George Mason served on the vestry of the Pohick Church, and played a major role in the decision to change its location from the old site on the King's Highway, where the Cranford Church is located today, and to build the impressive Georgian structure at its present location on Old Colchester Road at the intersection with present day Route 1. George Mason's primary business was that of a farmer, yet it is for his political career and writings that he is well known. He was the author of the Virginia Declaration of Rights and the Fairfax Resolves during the revolutionary years. He was a member of the Virginia delegation to the Constitutional Convention in 1789, but did not support the new constitution, due to its lack of a Bill of Rights. However, his influence contributed to the early adoption of the Bill of Rights, shortly following the approval of the new United States Constitution. Mason raised tobacco, and used the nearby port town of Colchester with its customs house. Colchester was the first town established within the borders of present-day Fairfax County. Chartered in 1753, the site was chosen by virtue of the topography of the land as the most accessible spot for a ferry crossing of the Occoquan River. The road north of Colchester was part of the great path linking Boston and Charleston, S.C. It was over this part of the road that troops under the command of Generals Washington and Rochambeau marched southward from Pennsylvania and a short stay at Mount vernon on to Yorktown to the climactic battle ending the American Revolutionary War. However, siltation of the Occoquan River, along with the construction of a bridge up river effectively put an end to Colchester's function as a port town. Today the old ordinary known as the Fairfax Arms, now a private home, is the only above ground reminder of a town that once rivaled Alexandria in importance. In the nineteenth century, the pace of life on Mason Neck slowed. George Mason's descendants sold off portions of land, until Gunston Hall went out of the family. In 1932 Gunston Hall was donated to the Commonwealth of Virginia making it the first public property acquired on Mason Neck. 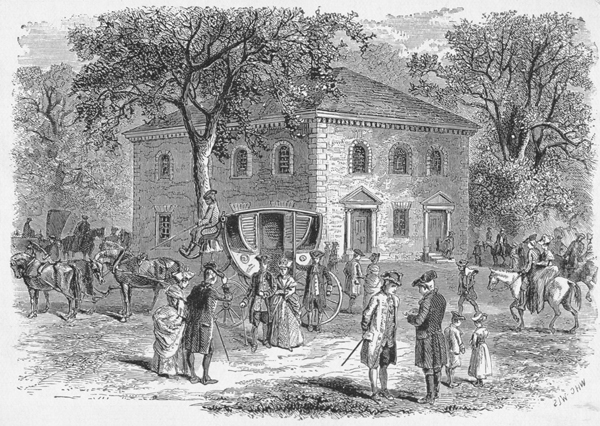 The disestablishment of the Anglican religeon, and the separation of church and state, which George Mason had supported, resulted in hard times at Pohick Church, but also in a diversication of religeous groups in the area. In an informative and delightful memoir "Memories of a Plain Family" Susan Annie Plaskett tells the story of the Plasketts and the Cranfords, who built a Methodist Church on the site of the old Pohick Church. Cranfords also built Indian Springs Farm, a structure at the entrance to Mason Neck. In the 1960s, the pressure of suburbanization were beginning to be felt in Mason Neck. In 1965 a proposal to create a new town on Mason Neck was revealed and the 1965 Fairfax County Plan showed the then proposed "outer beltway" cutting through Mason Neck and intersecting with the proposed extension of the George Washington Parkway. Led by concerned and dedicated citizens, including Elisabeth Hartwell of Mason Neck, a tenacious grass roots effort was initiated for the preservation of Mason Neck. The State made initial appropriations and the County held a bond referendum for the acquisition of parkland. The Nature Conservancy made an initial purchase of 1,945 acres for approximately $3.5 million in July 1967. It continued to purchase additional land through the mid-1980s to hold for the Northern Virginia Regional Park Authority (NVRPA) and the U.S. Fish and Wildlife Service. Parkland on Mason Neck is now owned by the Fairfax County Park Authority, the NVRPA and the Commonwealth of Virginia. The U.S Fish and Wildlife Service manages the Mason Neck National Wildlife Refuge. Gunston Hall itself is the property of the Commonwealth, having been donated by its last owner, louis Hertle. In the 1990s, a task force was formed of Mason Neck Citizens working with Fairfax County planning staff to make recommendations for a Mason Neck Historic Overlay District and guidelines for future development on Mason Neck. Final County adoption of Historic Districts on Mason Neck is still pending. One of the "reach-for-the-stars" land development recommendations was for a land swap, involving the transformation of the Lorton Prison property to community use, that could dedicate a large parcel of private lands to park or desireable public use. On Dec. 18, 2001, Reps. Tom Davis (R-Va.) and Jim Moran (D.-Va.), federal, state, and county officials along with citizens of the Mason Neck region in Fairfax County celebrated the culmination of more than two years working together to preserve more than 800 acres of open-space land on the Mason Neck Peninsula The land exchange was a complicated deal involving the General Services Administration, the BLM-Eastern States, the county, a developer and a private landowner. The property on Mason Neck is now managed by the Bureau of Land Management and is home to a rehabilitation facility for wild burros. BLM plans a diversity of public educational and recreational activities including trails on the property. In 2003, VDOT installed an historic marker on Route 1 near Furnace Road commemorating the town of historic Colchester in a ceremony presided over by Mount Vernon Supervisor, Gerry Hyland. Also in 2003, Old Colchester Road was granted the classification of Virginia Historic Byway by the Commonwealth of Virginia. This series of four slideshows represent the content of interpretive displays scheduled for construction at West Mason Neck Park on Old Colchester Road in the Summer of 2009. The displays commemorate the passage of the Washington Rochambeau allied Armies through Northern Virginia and Mason Neck during their journeys to and from victory at Yorktown in the American Revolutionary War. The idea for the displays was conceived by the Lorton Heritage Society as a Transportation Enhancement Program (TEA-21) administered by VDOT in Virginia. The successful program application was written by Joseph Chudzik of Mason Neck, the display design and illustration was provided by Lyonshare Studios, LLC (Sallie and Jerry Lyons) of Mason Neck to satisfy the TEA-21 in-kind matching fund requirements, and the project management is provided by the Fairfax County Parks Authority.